We’re getting late into fall and already starting to think about Thanksgiving, Christmas, and the Q4 release. Before we get into all of that, I want to take some time to look at three major enhancements to the Recruiting platform that could have major impacts, both from a business process and cost perspective, to your company/clients. Previously, there could only be a 1:1 set-up between ATS and recruiting marketing – you could not have multiple recruiting systems channeled into a single external marketing website. Now, multiple recruiting systems can flow into your recruiting marketing site. I see this as having two major advantages. The first is that some larger clients may have certain parts of their company that is unwilling or unable to make the move to SuccessFactors. This can be a challenge when wanting to maintain a single recruiting marketing site for your external candidate experience. Now different areas of a company can maintain their current recruiting system while operating under one external site. The second advantage is that it can simplify your migration from your legacy recruiting system to SuccessFactors. Previously, clients were limited to two ways in which to do a cut-over from your existing ATS to SuccessFactors. The first was to do a migration of requisitions, candidates, and applications into SuccessFactors via template import. Based on the volume and complexity of your existing recruiting data, this could be a time consuming and challenging process. The second option was to simply run off existing requisitions in the existing system while opening new requisitions in SuccessFactors, but this often required careful consideration on timings, as well as maintaining two separate recruiting sites until the runoff is complete. With this new feature, clients can elect to connect their new recruiting marketing site with their existing recruiting management system, concurrently with SuccessFactors, until the legacy system is sunset and there are no more remaining requisitions. Since recruiting is one of the more difficult systems to do cut-over and migrations for, this could really help alleviate that process. Jobs from both systems would be imported into the recruiting site. When a candidate applies for a job, they will first go through the Candidate Account Simplification account process in SuccessFactors RCM. 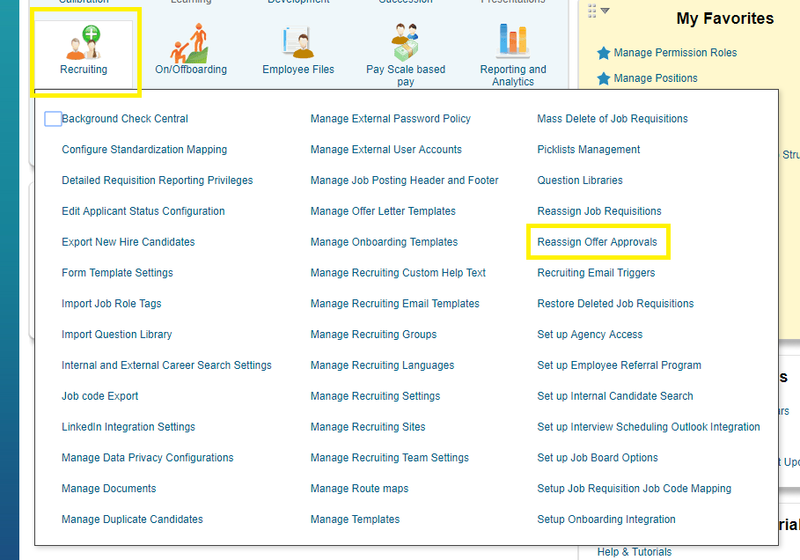 Logic within SuccessFactors RCM decides whether the job resides within SF RCM or the other application system. If the job is within SF RCM, the candidate will continue the job application process within SuccessFactors. If it is not, the candidate is redirected to the other ATS system. Your SuccessFactors recruiting management instance must continue to use the Real Time Job Sync to bring jobs into the recruiting marketing site. Other recruiting management/ATS instances that are being connected to the recruiting marketing site would use JATS job sync. Depending on the other recruiting management system you are using, middleware may be required to transform the job data to JATS standards. Candidate Account Simplification is required to be on so that the workflow to the other ATS system will work. Proper change management and communication is required within the company to so that end users understand when and how to use two recruiting management systems. Some clients utilize multiple SuccessFactors instances. Unfortunately, only one SF instance may be connected to the recruiting marketing site. The set-up for allowing multiple recruiting management systems into your recruiting marketing site is very easy, but requires a partner with recruiting marketing certification to complete. The partner needs to access your site’s Command Center. From there, go to Site>Site Set-up>SSO. On that page, there is a simple switch to turn on “Use Multiple ATS”. You can see this selection is a child selection under Candidate Account Simplification, as this setting is required to be on for multiple ATS to work. At this point, set-up would need to be done to have your recruiting site import SuccessFactors recruiting management jobs through the real time job sync, and jobs from your other recruiting management system via JATS import. Reassigning offer approvals within the system is nothing new. Clients have previously been able to do this using the Route Form tool, since offers are considered forms. However, the tool was never meant to used with offer approvals and the tool would often throw errors, since offers don’t follow route maps the same way other forms in the system do. SuccessFactors heard this pain point from clients and introduced a new tool that is totally dedicated to rerouting offer forms. In conjunction with this move, they have also blocked the use of the Route Form tool for offers. This is going to really help clients manage their offer forms. I always hear in workshops concerns around recruiting processes that can get stuck in someone’s workflow when they are either out-of-office or has left the company. While other forms have been easy to manage with the Route Forms tool, offers have been more tricky. The usual suggestion it to have the originator pull back the form and send again to a new approver. However the volume and complexity of the offer form can make that time consuming. With this tool, multiple offers can be re-routed with just a few clicks. The offer can only be re-routed from an approver if it is currently in their To-do list to approve. If there are still approvers in front of them, you will have to wait until it hits their To-do list. You can reroute an offer from a person even if they are inactive. This helps with people who have left the company but still have offers to approve. 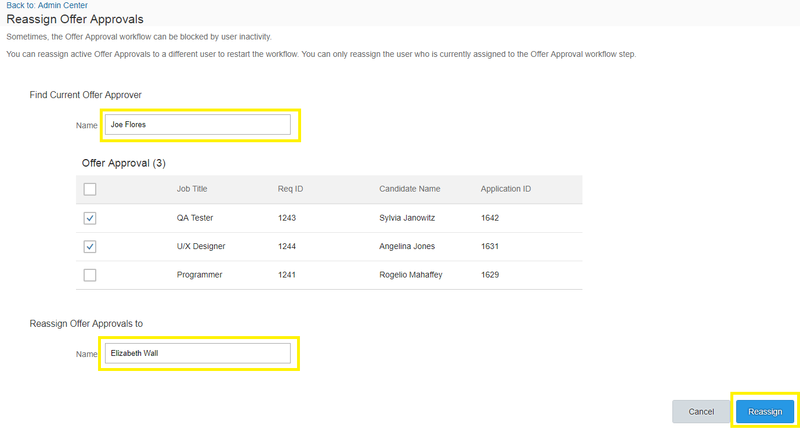 Any active user within the company can be selected to route the approval to, even if the new approver was not in the specified role/group on the offer approval template. Because of this, you will want to take extra precaution as to who has access to this tool. I recommend giving it to only a trusted group of recruiting admins who will re-route the forms correctly. Turning on the Reassign Offer Approval tool is easy – the permission just needs to be added to selected roles in Role Based Permissions. Go to admins tools>set user permissions>manage permission roles. 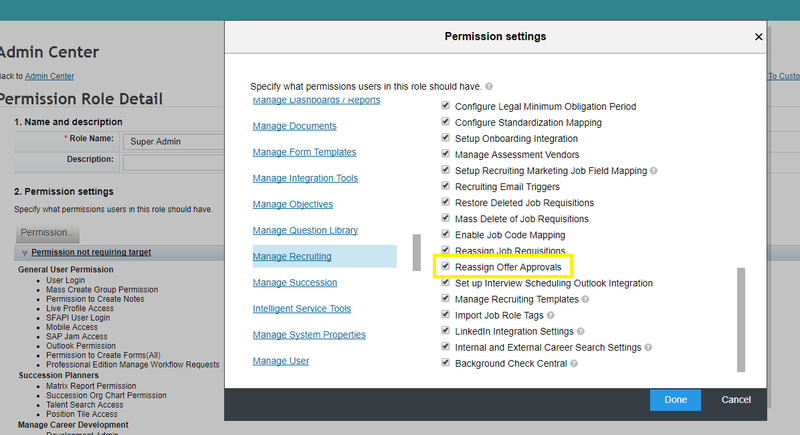 Select the role you wish to modify, then add the Reassign Offer Approval permission under Manage Recruiting. Users in this role will now have access to the tool. Once permission is grated, users in the role can go to admin tools>recruiting>reassign offer approvals. When the tool is launched, the user would type in and select the name of the person they are re-routing the offer from. Once the name is selected, the offers in that persons To-do list will auto-populate. Select the offers that you wish to re-route, then type in and select the name of the person you are routing the forms to. Once done, click “Reassign”. Once clicked, you will get a confirmation page. Click “Yes” to continue. The system will let you know that the offers were reassigned correctly. The new approver will be notified that they have an approval in their To-do list. The admin will also get a summary notification of the action. Finally, I want to give a high level overview of some of the advancements made recently by SuccessFactors with background checks. Previously, standard integration with background checks was limited to two vendors – First Advantage and Verification, Inc. Clients who did not want to play for a custom integration to other vendors would have to make a switch to one of these services if they wanted the flexibility to launch and track a background check within SuccessFactors. This could put clients in a difficult spot, as many who did not have the budget for a custom integration and could not make the switch to the two standard providers were forced to do background checks outside of the system. If a client did have the budget to create a custom integration, it would not fully use the capability of the module. Candidates would have to be moved to specific statuses to launch the process, and only fields created on the application would be updated. The is in contrast to the standard SF functionality, whereby there is a Initiate Background Check action button and a background check portlet that would capture the results. Understanding that issue, SuccessFactors has begun to open the recruiting module up to other vendors. Clients can now create an integration to use the standard functionality above with the custom vendor of their choice. At this point, only one custom vendor can be used – clients requiring multiple vendors will still need to use API. This is a major step forward in opening the suite to more outside vendors. SuccessFactors is looking to add more vendors to it’s list of standard integration partners for background checks, but the hope is that this extends beyond background checks and that other assessment tools and vendors are added to this list. Next Heads or Tails? In Marketing, we need to make many choices. Which ones do you make?